In what should be a game-changer for climate campaigning, the divide between ‘weather’ and ‘climate’ has been closed, as German scientist Friederike Otto and colleagues have succeeded in attributing the role of climate change to an ongoing weather event (the Great Northern Heatwave) in just three days. The breakthrough has added significance because the official German weather agency plans to introduce ‘real time’ climate attribution in 2019, and an EU agency expects to follow suit. Consequently the ‘climate factor’ should appear in daily weather reports and forecasts. This has profound implications for public perception and will tend to normalise acceptance of climate change, as ‘climate pollution becomes pollution of the weather’. This blog identifies three opportunities and needs for campaigners: a ‘weather dividend’ in expanding the base, creating crises of responsibility for corporates and politicians, and pivoting public psychology from ‘giving up’ to demanding action, drawing on attribution itself. It proposes new weather indices for comparing the polluted to the unpolluted climate, for averages and events, and a climate version of the Atomic Clock. It warns that fossil-fuel lobbyists will try to keep the climate factor out of weather reports. An important if under-reported connection was made last month, which should be a watershed in the strategies of campaigns against climate change. Until now, weather has come with added climate change but it’s been missing from weather-forecasts and reports. From now on TV-weather can come with an identified percentage of climate change. This change came on 27 July, after a team led by German scientist Friederike Otto spent three days working as fast as they could to analyse weather data from the unprecedented heatwave gripping Europe and much of the Northern Hemisphere, against climate models. They announced at ‘World Weather Attribution’, that the ongoing heatwave had been made twice as likely to occur, due to human-made climate change. So rather than taking months or years to look back at past trends or individual extreme weather events, as many previous ‘attribution’ studies have done, Otto’s team managed to do so in near-enough ‘real time’. Three days is a short enough time period for major weather events to still be playing out and noticeable to the public, media and even politicians. This is a game-changer for communications about climate change, or it should be. In effect Otto has closed the gap between ‘climate’ and ‘weather’. Climate-change is joining the mainstream conversation, not as an ‘if’ but as a reality. 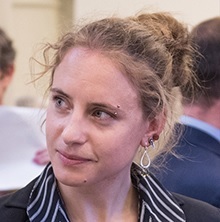 Dr Otto is an Associate Professor in the Climate Research Programme at the Oxford University Environmental Change Institute. She is one of the world’s leading experts in saying whether the world’s weather is being driven by climate change [aka ‘attribution’ science]. In this case the answer was “yes” by odds of 2:1. Also with admirable speed, the Science journal Nature published a brilliant article by Quirin Schiermeier on 30 July, explaining Otto’s achievement and attribution science. Ironically many of the scientists working on these projects – the climate equivalent of rapid response in disease control or emergency medicine – have been doing so in their spare time with very few resources, although there are some signs that this may be about to change. Schiermeier (Nature’s German correspondent) also reports that ‘with Otto’s help, Germany’s national weather agency is preparing to be the first in the world to offer rapid assessments of global warming’s connection to particular meteorological events’. As a Brit who has worked on climate change since 1988, I simultaneously feel embarrassment that it takes the German weather service to do this, working with a British based German climate scientist, and (on behalf of the planet), gratitude. Thank goodness for the Germans. It’s always been the case that people’s direct experience of weather plays a role in their response to any mention of ‘climate change’. In 1988 Jim Hansen of NASA famously gave influential evidence of climate change to Congress, in the middle of a heatwave. His facts and figures showed a progressive temperature increase in line with climate modelling of the effect of CO2 emissions but his declaration that he was ‘99% certain’ it was ‘already happening’, had much greater impact because it felt hot. A problem with global warming feels more compelling if you feel hot: it’s a salient problem, ‘front of mind’, and our feelings and intuitions influence our ‘rationality’. Of course it’s not only feeling hot or cold which influences our responses to ‘climate change’ as an ‘issue’. 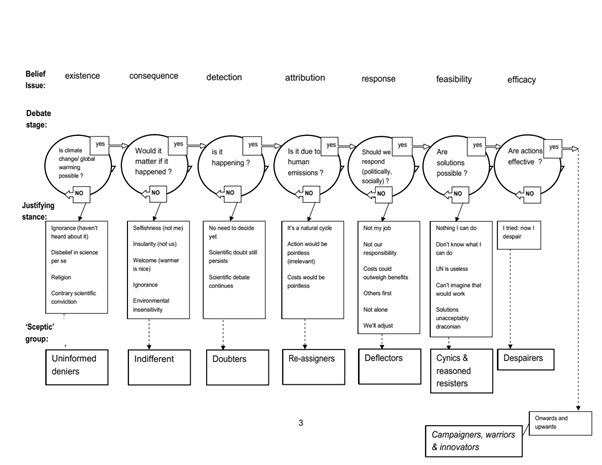 Because it is conceived by use of data and computer models, ‘climate’ has always been a ‘Track 2’ issue, requiring analytical thinking, weighing of probabilities, faith in the scientific method, and, when it comes to responses in terms of changing how we live and work, a sufficient sense of self-agency to embrace change. Where these factors have been lacking, many people (including politicians) have avoided thinking about such a knotty and apparently ‘not yet’ problem by resorting to what Daniel Kahneman calls ‘substitution’: replacing a hard question with an easy one, such as “do scientists agree?” or “do scientists say it’s happening now?”, or “do I want to keep driving my [fossil fuelled] car?”. This flips the ‘issue’ back into everyday ‘Track 1’ world, where decisions are driven by intuitive, feelings unconsciously shaped by heuristics, values and framing. That has resulted in going on doing what feels normal and familiar on the one hand, and in climate scepticism on the other (denial being a psychological free-pass from having to engage with a new reality). You can see the effect of values on climate attitudes in 15 countries in this blog and report, based on surveys for Greenpeace International. Manipulating such reflexes and perceptions to undermine climate action has been easy, starting even before Frank Luntz’s notorious 2002 memo to pro-fossil fuel US Republicans, pointing out that they did not need to win the argument about whether climate change existed, only to sustain the debate. Given the way science works, a debate amongst scientists is almost inevitable on any topic, so the fossil fuel lobby were gifted a cheap way to sustain disbelief. The UN system set up to respond to the climate change threat put climate scientists in pole position through the IPCC and UNFCCC (Climate Convention), and they dominated ‘messaging’ about it. Mostly out of naivety, many tried to communicate the need for political and social action by explaining the science. ‘If a scientist refers three times to uncertainties, people conclude that she or he is uncertain. Would you act on uncertain advice? Well, no. When a research scientist is asked what needs to happen next, and she or he says ‘more research’, do you conclude it’s time for action? Well, no’. Fortunately many more members of the scientific ‘climate community’ are now applying themselves to the task of improving communications, and thinking about what’s needed to get an effect, rather than just getting their next publication out. For example, Earth Sciences Professor Chris Rapley at UCL chairs a Commission which brings together natural scientists, social scientists including psychologists like Kris de Meyer of Kings College who interestingly studies why people who are wrong think they are right, and communications practitioners from advertising and elsewhere, even sometimes campaigners like me, on this agenda. ‘Otto says a rapid attribution service is needed because questions about the role of climate change are regularly asked in the immediate aftermath of extreme weather events. “If we scientists don’t say anything, other people will answer that question not based on scientific evidence, but on whatever their agenda is. So if we want science to be part of the discussion that is happening, we need to say something fast”’. Some scientists, added Schiermeier, ‘might feel uncomfortable if weather forecasters announce results before work has gone through peer review’. 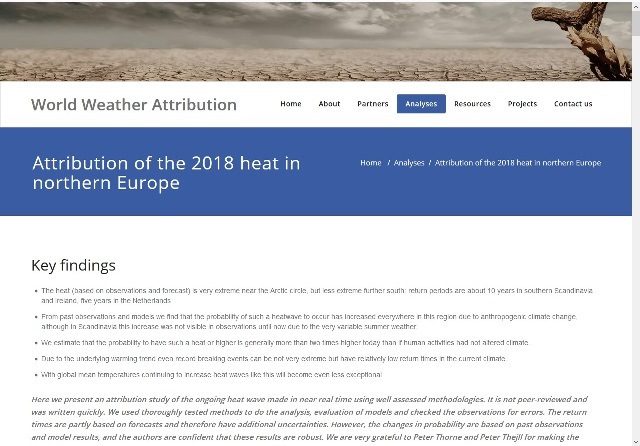 But he notes that Gabriele Hegerl, a climate scientist at Edinburgh University, points out that the science of attribution has advanced rapidly and ‘would benefit from being linked to operational weather prediction’. “It can be really useful to have results quickly available for event types we understand reasonably well, such as heatwaves,” she told him. Or as Otto put it: “You don’t need to peer review the weather forecast”. Ever since climate change became an issue it has been obvious that what’s on the daily weather forecast, influences public perceptions. Hardly anyone talks to climate scientists but nearly everybody sees weather forecasts, and many TV forecasters are local or even national celebrities. So far, we don’t have daily climate forecasts but we do have daily weather forecasts. Therefore what media weather people say matters, not just because they have our attention but because they give meaning to the weather, and climate. Two ways weather meets climate are when ‘weather forecasters’ relate day to day weather to past averages, and when they interpret ‘extreme events’. While there are cultural differences between nations, in countries like the UK, ‘good weather’ is usually taken to be synonymous with it being warm and dry. Hence the ‘good weather’ frame in Britain, and probably many other temperate northern countries, contains the elements ‘warm’, ‘sunny’ and ‘dry’. So weather forecasters in Britain frequently describe warmer, drier or sunnier days as ‘good’ or ‘better’ and describe departures from the long term or past averages as “better than expected” or “good for the time of year”. So a hot summer day is celebrated, and so is a warmer than ‘normal’ winter day. You do not need to be a cognitive psychologist to see that this frame tends to confound any claim that warmer, hotter weather is a bad sign. For decades it was an uphill struggle to interpret ‘global warming’ as a bad thing, in countries like Britain. Confusingly, the most obvious units of both weather forecasts and of global climate models are the same – degrees of temperature – yet they have very different meanings. People are used to seeing TV weather charts with a range of temperatures of say 5 – 10.C over one day or within a week, and it makes little difference aside from the warmer ones being welcomed as something to look forward to, or signalling that you might need to ‘wrap up’ or ‘put on sun cream’, or that you are ‘lucky’ to live in one of the warmer spots. With this framing, it makes no intuitive sense to be alarmed about a 1.5 – 2C rise as a disaster and 3-4.C as probably a catastrophe, just because it is applied to global averages. Consequently campaigns and ‘scientific’ announcements to that effect, are simply filtered out, discarded as George Lakoff might say, because they do not ‘fit the frame’ [of warmer = better]. The conventional answer to this problem from the meteorological establishment and media such as the BBC is to occasionally introduce an ‘expert’ voice such as a Science Correspondent, usually when there is a report from the IPCC or UNFCCC to talk about, or if weather extremes make the news and advocates of climate-action are asking attribution questions. They then try to ‘square the circle’ by resorting to what has become a mantra along the lines of “while you cannot attribute any single event to climate change, scientists say [this is consistent with what we may expect in the future] [this is the sort of event we may see more of in the future as…]”. Repeated over and over these amount to raising the question “is this climate change?” and then dismissing it. Question-dismissal, question-dismissal, question-dismissal … etc. So such qualifications decode as reassurance; it’s expected, it’s not climate change, it’s not immediate, and “there are a lot of if’s but’s and maybes”: uncertainty. Scientists taking this approach may think that listeners will realise that some of the events or part of the drivers behind events are driven by climate change but if the out-take from each one is that it is not attributed to climate change, the overall effect is ‘climate change isn’t affecting our weather’. Weather forecasters sometimes use a different frame, one of ‘normal’ or ‘abnormal’ weather [as opposed to better/worse = hotter/ colder] but even then, they usually do so by reference to statistical averages, and very few of the population or media or politicians understand averages in an analytical way. Explicitly saying “this weather is abnormal” could have a very different impact but in their Track 2 professional world, weather presenters and meteorologists are aware of the backlash they might experience if they appeared to say something ‘not scientifically accurate’. So even when weather has become so extreme that their audience is already talking about it, there is still a residual reflex to play it down. For example by saying that although it’s the biggest X for decades, it did happen once before at some distant point in the past. Although that’s not exactly ‘scientific’, it is arcane knowledge and sounds expert. As a result of all this, far from being a driver of public concern about the reality of climate change, for many years most media weather forecasts have acted as a political analgesic. Trying to squeeze a climate change perspective into a TV weather forecast is obviously a fraught business. Some who have tried, have got into a tangle as they try to explain probabilities and intermediate factors like large scale weather systems (jet stream, arctic vortex, oscillations etc). One who has had some success is John Morales, award winning meteorologist for NBC in Miami Florida. 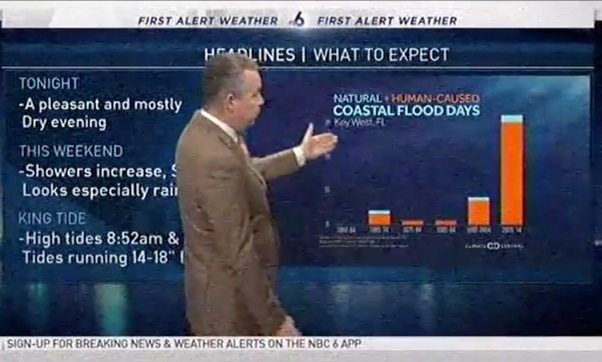 Morales (@John MoralesNBC6) has even taken the fight for scientifically realistic interpretation of the weather and climate to Donald Trump. In June Morales said on twitter that he and a handful of other TV meteorologists had been relating weather to climate change for years and ‘curiously’ were considered ‘mavericks’, but now there is a ‘groundswell’ of many more doing the same thing. Morales may soon be getting reinforcements. Schiermeier now reports that the German weather service is planning more or less immediate climate attribution analyses in 2019 or 2020, and the European Centre for Medium-Range Weather Forecasts (ECMWF) in Reading, UK, is also planning a pilot pan-EU scheme in 2020. Presumably this will leave TV weather presenters with little excuse for prevarication over climate change. In my view, what they really need to turn the impact of climate change on weather into something that is news-friendly, is an index, or maybe more than one. The ‘cognitive ease’ of an index is why news services routinely report stock market indices, even though most of the audience has little real idea what the Dow Jones or FTSE 500 actually means, and it’s questionable what they say about the ‘real economy’. In the news room, economics and business are held to be important, and this is a quick and easy way of covering them. Likewise, the Saffir-Simpson 1 – 5 category scale for Hurricanes makes them a lot more ‘newsworthy’ because it makes them easier to report. Relating ecosystem (and farming) tolerance to rates and total amounts of change is where target figures like 1.5C or 2.0C in the C21st come from, compared to the 1961-1990 average. So for its’ benchmark, any such Climate Attribution Index should relate to the ‘unpolluted’ atmosphere, when it comes to temperature records. 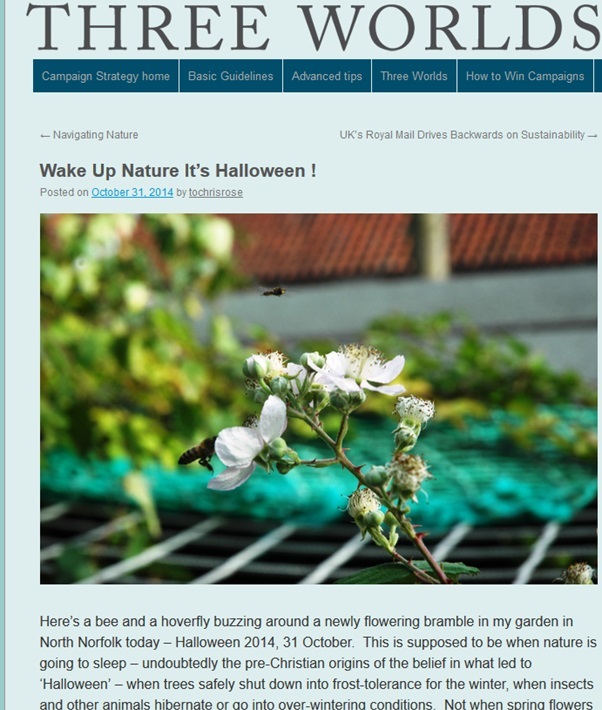 This won’t prevent people experiencing the shifting baseline syndrome: my children can’t remember the frosty autumn mornings I experienced as a child because they weren’t born then but it could ‘bake in’ the destination-objective of returning the atmosphere to an unpolluted state, which presumably is what climatologists and meteorologists actually want to happen, within the public climate conversation. 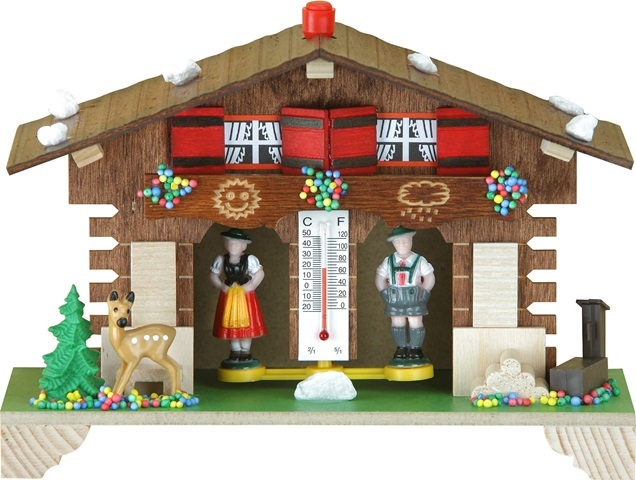 Weather interpreters also need a scale for events – expressing the ‘amount’ of Human-Induced-Climate-Change attributed to an event [HICC index or maybe Hansen Units or Otto Units?]. It might help if climate scientists also had something like the ‘Atomic Clock’ which was some sort of ‘attribution’ index reset every once in a while, so anyone trying to ‘take the temperature’ of the issue could say “with the XXXX set at YY, it is …”. I don’t know for sure but as they see the reality of climate change crashing weather all over the world, some campaigners may be wondering where next to throw their efforts. One thing they could do is to help the climate attribution community navigate the process of bringing out the truth in terms the public can understand. Otto’s work creates three openings: first, to activate the ‘weather dividend’ in terms of public engagement, second the need and opportunity to hold politicians and corporates to account over climate change, and third the need to pivot the psychology from ‘giving up’ to demanding action. For a long time surveys have tended to find that more people say they have noticed the ‘climate changing’ than that they ‘believe in climate change’. 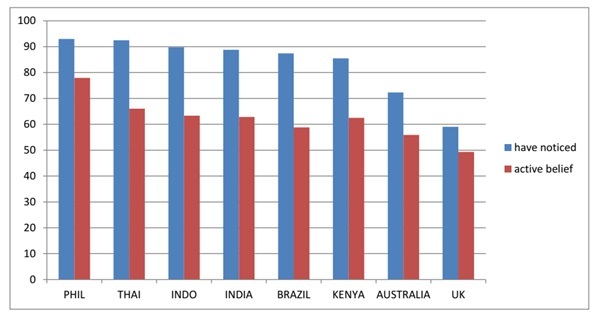 Two of the statements tested in the 2011-2015 series of surveys for Greenpeace International mentioned earlier were ‘I have noticed that the climate seems to be changing’ (in eight countries) and ‘Climate change – I don’t believe in it’. This can be compared to results for the statement: ‘climate change – I don’t believe in it’, (details here). The chart shows the proportion who agreed strongly or slightly that they had noticed the climate changing, and the proportion who were ‘active believers’ in climate change, in that they slightly or strongly disagreed with ‘climate change – I don’t believe in it’. In every country, more people ‘have noticed’ climate change rather than ‘believe in it’, and these can add up to more than 100% because some of the people who profess not to believe in it, have also ‘noticed it’. This apparently irrational response is because the two questions are not answered analytically – hardly any of the public will have conducted or studied a ‘climatology’ of long term data or are experts on ‘detection’ of a human made climate signal – but intuitively (using Kahneman’s System 1 not System 2). Emotional reflexive rationality, not analytical reflective rationality. Although asked if they ‘have noticed’ the climate changing, this equates to ‘weather’, or short term or easily recall-able or ‘available’ experiences or events, including things like changes in wildlife and plants in the garden or at work, ‘unseasonal’ weather, and social conversations about them. These are in the realm of personal experience and are probably cued by being asked if you have “noticed” something. Especially in countries where ‘climate change’ was polarised as a political issue, the ‘belief’ question cues people to ask themselves “am I one of those type of people?”: a political/social identity test, and answer on that basis. This is one reason why the response not only varies in degree between countries but is strongly values-influenced in a way which is highly consistent across countries. Above: some Values Modes differences showing indexes only (for further explanation see here). Warm colours indicate strongly significant espousal/ agreement with the statement. 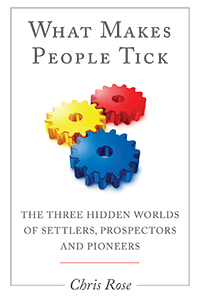 The overall difference between the two statement responses is most marked in the Prospector ‘Golden Dreamers’ and the Settler ‘Brave New Worlds’. These people are more climate sceptic than the population average but do tend to agree they have noticed the climate changing. It can therefore be expected that if weather forecasts and discussion of extreme weather events begin to include a climate-change factor, there will be an overall increase in agreement with propositions which are predicated on climate change as a reality and this will be greatest in the Prospectors and Settlers, especially GD and BNW. Seeing as many surveys show these people are the centre of support (although not the only support) for authoritarian policies, Trump, Brexit and right-wing parties, what appears in the weather forecast as a reality, has political significance. This will not be lost on the paid-for climate sceptic lobby who can be expected to try and keep the climate factor out of the weather reports and forecasts. 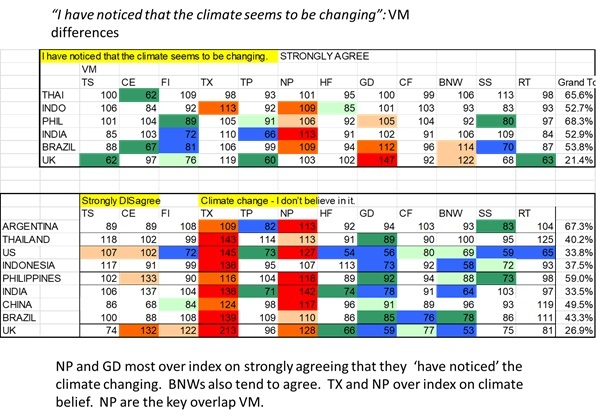 The effect of routinely including the climate factor in weather reports and forecasts, will be to normalise it, and Settlers in particular self-identify as ‘normal people’ and thus shift opinions and behaviours to stay in line with norms. Or as this previous Newsletter noted, ‘like cancer and smoking and the abolition of slavery, an issue, a contested topic, has to mature into ‘social fact’ for wholesale change on it to be acceptable’. Campaigners can therefore expect a ‘dividend’ in growing and broadening the base of acceptance of climate change, when the climate-factor appears in ‘the weather’. Climate pollution is becoming pollution of the weather. This is mainstream ongoing work for climate campaigns but with the gap between the changing climate and changing weather now disappearing, it too can be re-appraised. Well Otto has changed the second factor significantly, for which she deserves some sort of medal but I was being a bit glib: there is another factor, namely no perceived crisis of responsibility. Politically, Teresa May is in ongoing crisis over Brexit: will she fail to deliver, or fail to hang on to her job? Likewise Trump has a permanent crisis monkey on his back because of unresolved inquiries into his Russian links and other allegations but is only in real trouble if his supporters turn against him. In truth the fates of Brexit, May and Trump are inconsequential compared to the onslaught of climate change but media and the political classes feel no crisis from climate change. For most such ‘leaders’ it’s only a political problem, and at that principally a presentational one, on the main plenary days of COPs of the UNFCCC. Their reputations, jobs, status and freedom do not depend upon resolving it because as yet, they are not expected to take responsibility, and feel no political pain from it getting worse: no blame, no shame. ‘Here are three fundamental political truths relevant to many campaigns: first, politicians aspire to be in charge and remain in charge. Second, it is universally recognized that the first duty of government is to maintain public safety – from the integrity of the nation down to the safety of the individual. Third, little sharpens the political mind like being held responsible. Yet the impacts created by the new climate extremes tend to remain ‘disasters’ not crises. Why? Because there is no crisis of responsibility’. It went on to argue that we need to complement existing efforts to hold politicians to account in relation to global climate change (eg by activist lawyer groups), by also mobilising affected domestic political constituencies to demand that leaders keep them safe from local climate change. Otto’s work, and that of other attribution scientists, makes that much more feasible. Same goes for corporations like oil companies. ‘With climate impacts perceived to be occurring in real time, the politics of climate can be real-time, personal and local too. What would be the bigger political crisis, the fate of future generations, or a food shortage tomorrow? The future extinction of a third of the world’s biodiversity or a housing crisis this year? Once they have a crisis to deal with, politicians will start to look more seriously and more quickly, for the most effective solutions’. When I got sent a link to Schiermeier’s article in Nature I forwarded it to a friend who is a long-time climate campaigner in Greenpeace. She wrote back: ‘Thanks for that – good work! Just wonder how we stop people switching off when they finally get how serious it is’. Which is of course a very good point. It seems to me that there are two things campaigns and advocates need to achieve, if an era of climate-change-polluted-weather is to motivate action to clean up the atmosphere rather than to ignore it or give up. First, to fully desocialise fossil fuels, and second, to give meaning to climate-attribution of weather events in terms of the difference we could make. We need to desocialise fossil fuels so it becomes shameful to use them. The same goes for other climate change pollution of course but fossil fuels are the most egregious factor. This should not be done by universalist ethical criticism (Political Correctness which can lead to values polarisation) but is best founded on the one hand, in appeals to morality, to honour, duty, family and Jonathan Haidt’s six moral ‘modules’ or ‘foundations’. (Care/harm, Fairness/cheating, Loyalty/betrayal, Authority/subversion, Sanctity/degradation, and Liberty/oppression). These resonate most strongly with the GD/ Settler Values Modes discussed earlier, which is where the greatest work needs to be done. The Pope is an example of a moral authority heading in the right direction. Plus on the other hand, it needs to be founded in social proof: which means qualitatively and quantitatively amplifying the signal that living ‘carbon free’ is right and normal. 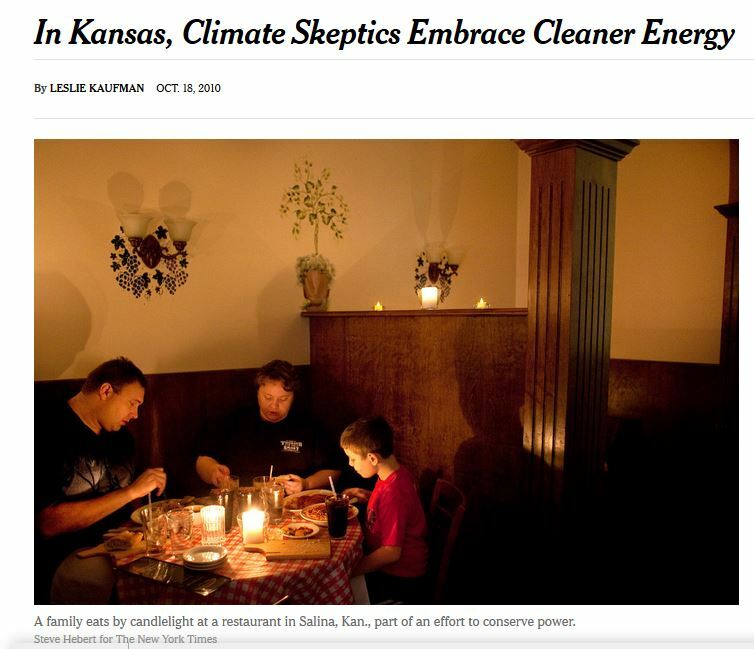 The Save Kansas project did this nearly a decade ago: a predominantly Settler community took to building wind farms, side-stepping their existing climate-scepticism, and finding justification in a sense of community benefit and loyalty, and freedom from reliance on foreign oil. Much more effort should go into making the transition from fossil fuels visible, obvious and socially approved of, and (especially for Prospectors) a positive signal of success and prosperity. Innovative politicians and campaigners should also make the right to be able to live a climate-blameless life (accessible, affordable etc) into a political and corporate issue. Demanding politicians and corporates make this possible, is a key step in driving out fossil fuels. We need politicians to compete to get rid of fossil fuels, not form a consensus that it should be done and then give it little priority. A social norm is defined not just by broad acceptance but by the social sanction that follows when it is broken. Those cheating, betraying, degrading or subverting our societies and children’s future need to be held to account. Campaign NGOs might think about how they can help organise or maybe more likely catalyse powerful and directed expressions of social disapproval against wanton climate pollution, and moral appeals to transgressors to change their ways. 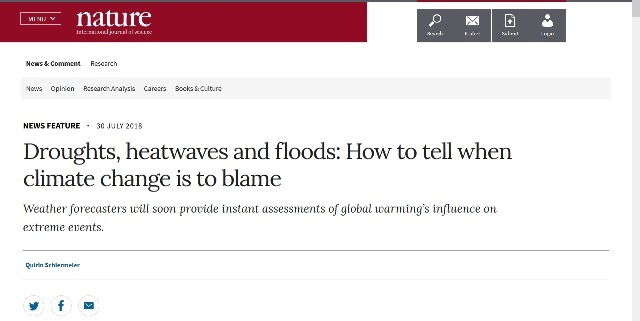 Remember that every time you hear a spokesperson or ‘expert’ trundled out in the media who says “everyone” is a bit to blame for climate change, their agenda is usually to avoid a focus on those who are a very great deal to blame. Nobody likes being blamed. Living ‘carbon free’ or being part of the disapproval, enables people to exempt themselves from blame. This in turn makes it possible to hear about climate change driving dangerous and bad weather, and be able to accept and relay that news, without feeling the need to stifle or deny it. For something which has been ‘normal’, such as using oil, gas or coal, getting there requires plenty of step-by-step disapproval: think of smoking (see Campaign Strategy Newsletter 26). We need to relate news of weather events attributed to climate change (bad news) to the difference we could make to extreme weather and impacts if we cut out carbon pollution ie fossil fuels (good news). Put the difference in terms of weather: eg it would cut the excess of such extreme floods by x%. This is what PR people sometimes call a negative-positive story. We give a sense of agency, the difference we could make, and avoidability, not despondency and despair. This also feeds the scandal equation: if a disaster is avoidable then it is scandalous, and someone is to blame. Both of these steps enable people to avoid cognitive dissonance on hearing that their weather is being pollution-driven. They give people something positive to say when a disastrous impact occurs: enabling disapproval of others who are to blame, and equipping them with a way to express the solution. Friederike Otto is not the only scientist working in this field but she has done the world a favour. Campaigners should seize the opportunity she has created. The heatwave has also brought climate change and weather together in popular perception. 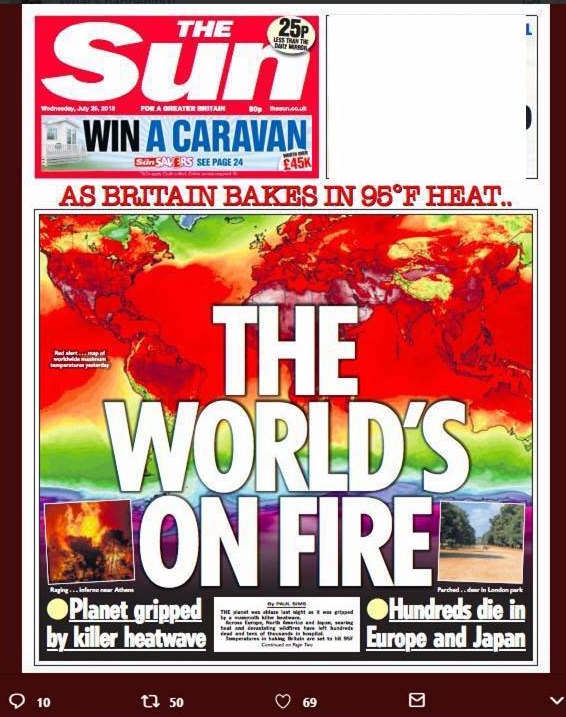 On 25 July, two days before Otto’s report and five days before Steinmeier’s article in Nature, Britain’s most popular daily newspaper The Sun had splashed a global temperature map across it’s front page, with the headline ‘The World’s on Fire’. Veteran environmental journalist Mike McCarthy spotted it at his local news-stand and wrote in The Guardian a week later, “I nearly choked on my KitKat* when I read that”. This is because the Murdoch-owned Sun has long been regarded as a firm part of the ‘climate sceptic’ tendency, so the coverage in The Sun was, as Mike said, a ‘historic shift’. 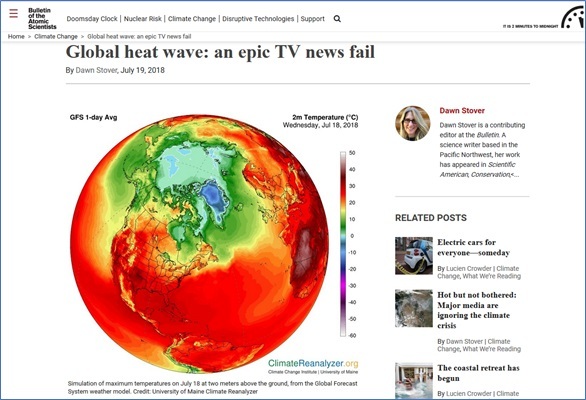 McCarthy’s article was headed ‘Was this the heatwave that finally ended climate denial?’ Probably not but the media will be cooling on climate denial, and Otto’s work makes that end a whole lot more possible. (*For non-UK readers: KitKat is a chocolate bar brand owned by Nestle and popular in Britain). I enjoyed reading the news-letter. I like the rating idea, “weather polluted today on scale four”. Just like in Hong Kong they hoist the weather signal, with higher numbers indicating more stormy weather. I`m going to use the ranking numbers to describe `the awfulness of my City Council shambles on trying to develop the city centre site it has bought from a developer, with no published plans as to what they will use it for.